CTFishTalk.com: Where next? 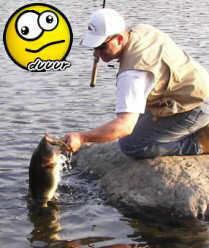 - Connecticut Bass Fishing Reports ( CT Bass Fishing Reports ) - A Community Built for Connecticut Fisherman. Posted: Thu Jul 13, 2017 3:52 pm Post subject: Where next? Took another rather unproductive trip to Highland lake overJuly 4 weekend. Boat traffic was crazy! Got 2 bass in a cove hiding deep in the cattails. Got them on a senko fished slow. Thanks PECO. The trip was shortened by boat issues. It turned out to be a spun prop hub. I didn't hit anything and the prop is only a month old So last Sat. I dusted off old my old reliable kayak and took her out for the first time this season. I headed to Plymouth resevoir. It is one of my favorite spots so far. It was opened to fishing and kayaking 2 or 3 yrs. ago but still gets very little preasure from what I see. I got there right at 6am with a frog on 1 rod and a popper on the other. I couln't resist taking a cast in the lillies next to the launch.2lber on the frog 1st cast. I heard that catching a fish on your first cast is considered bad luck but it felt pretty good to me. I launched the kayak and paddled to the lillies on the eastside. I picked up another 4 on the frog in the first 1/2 hr. They were all 1lbers but it was fun. Fished the popper for a bit got 1 tiny lil fella about as big as the popper. 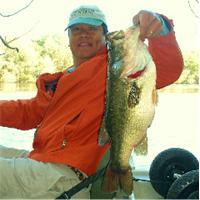 My upper arms were killing me from working the topwater baits. I'm old, but damn I'm not that old. I can't be the only one whose arms are dying after fishing from a kayak for an hour. Spent another 1hr. fishing a shakyhead worm on some offshore structure .Got another 5 bass. Biggest 1.5 lbs. I left them biting at 8:15 Love that place. Boat is fixed and I'm heading out with my son Sat. morning . Not sure where we are going yet. Any suggestions? Thanks for the report, Mark. I've never been to Plymouth Reservoir. I'm glad to see that someone got out. I've been too busy since spending a week down in Virginia. While I got to go fishing over three days down there, the weather was just like it is here, now, with constantly threatening electrical storms. The bite was slow. It sounds like the weather is having the same effect, here.